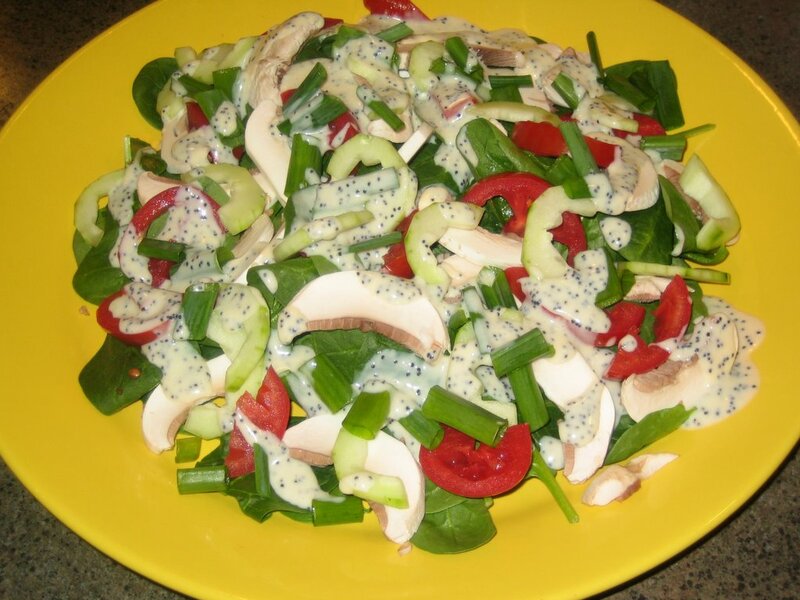 Once in a while I get a craving for my Creamy Orange-Poppy Seed Dressing, pictured here drizzled over a baby spinach salad. Most of my salad dressings are vinaigrettes. That's because I don't like using a lot of vegan mayonnaise or sour cream to make a creamy dressing. They often become heavy and thick, which is fine for dunking raw veggies, but not what I want to dress a salad. This dressing, from Vive, is creamy and yet light, using soft tofu, just a couple of tablespoons of olive oil, and tasty seasonings. A breeze to make too! All the ingredients except the poppy seeds are whizzed together... seasonings then adjusted if needed, another whiz and then stir in the poppy seeds. 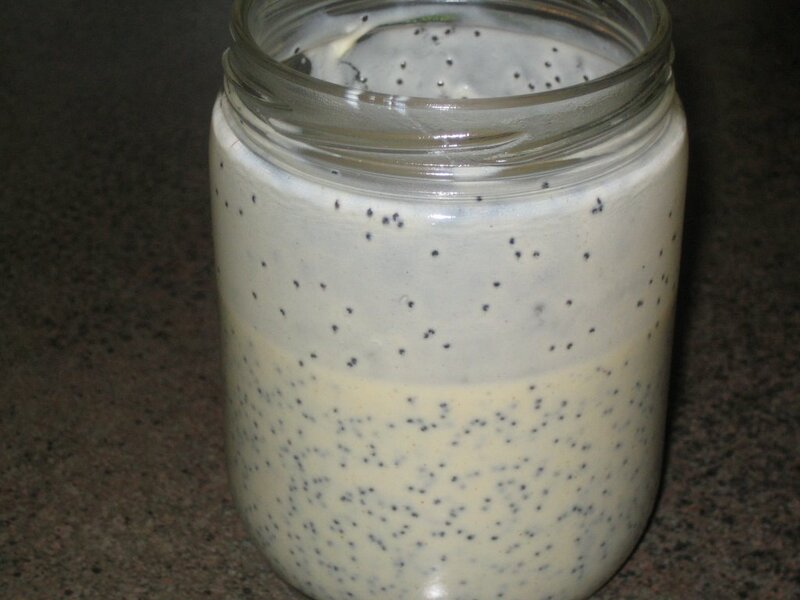 Here is my dressing after stirring in the poppy seeds. I keep and reuse the large jars from nut butters to whiz up sauces and dressings. Perfect size for the handblender. By the way, do you guys have an immersion/hand blender? If not, seriously consider buying one. They start at about just $20, and are easier to use and clean than a blender. You can make shakes, sauces, dressings, and puree soups... I use mine all the time! That salad looks great! And the immersion blender in a jar idea is genius. I got a Braun Multiquick MR 400 hand blender/chopper for Christmas this year and I absolutely love it, http://www.braun.com/na/products/fooddrink/foodpreparation/handblenders/mr400.html. So far, I have successfully used it to make soup (I made ginger carrot soup twice and ginger butternut lentil soup twice), smoothies (with frozen blueberries and bananas), faux sour cream (with silken tofu), and to chop lots of onions. MmMmMm...Looks good Dreena. I've tried you Cider Dressing (forgot the name) and it was great! I can't wait to try this creamy dressing. btw, Do you think it would be good as a dip w/ raw veggies? Thanks Chris, though I think you would probably take a better photo of it! :) I'm liking genius, though, that works especially well for me on this particular day feeling rather tired with 'mommy brain'! Danielle - now don't you wonder how you lived without your immersion blender and chopper? I find it invaluable. I use the chopper attachment a lot for small purees for the baby, and also for grinding/chopping nuts, garlic, etc. I never use my big blender now. It just sits in the cupboard! Hi Julie, you certainly could use it for a dip, but it is a little thinner in consistency than most creamy-type dressings... so, you could make it thicker by reducing the amount of OJ in there, increasing the oil (but just a bit) and using the full 3 TB of poppy seeds. You could also increase the tofu in there, but not too much or the taste will be affected and just taste too "tofu-y"! I was just think the other day, that I need to try this recipe out. I was holding off until I picked up some baby spinach though. Looks good! I love my "blender on a stick"
And my sister thinks I'm crazy for saving my nut butter/apple butter jars! It's called resourcefulness, darling sister! Hi Mal, I use them all the time. I usually make salad dressings or tahini sauces in them with my handblender and then store them in the fridge. Super handy! Sounds like this would be great on salad.